Boot knives are handy and easy to carry self-defense tools and are great for carrying during adventures. It is a concealed weapon that can be tucked inside your boots and mostly used for wilderness activities. If you love hunting, camping, hiking, trekking etc. it is important to stay prepared for any uncalled dangerous situations and the boot knife is the ultimate survival tool. It is not easy to find the best boot knife that has excellent features but this comprehensive guide will help you make the right selection. It is the ultimate self-defense tool and comes in handy when you smell danger. It is small, compact and concealable making it a great tool to use against lurking danger. If you are wilderness enthusiasts and spend most of your hiking, hunting and enjoying outdoor sports, this is the best buy for you. The sharp blade helps in hunting, cutting creepers and keeps you prepared for any uncalled danger. 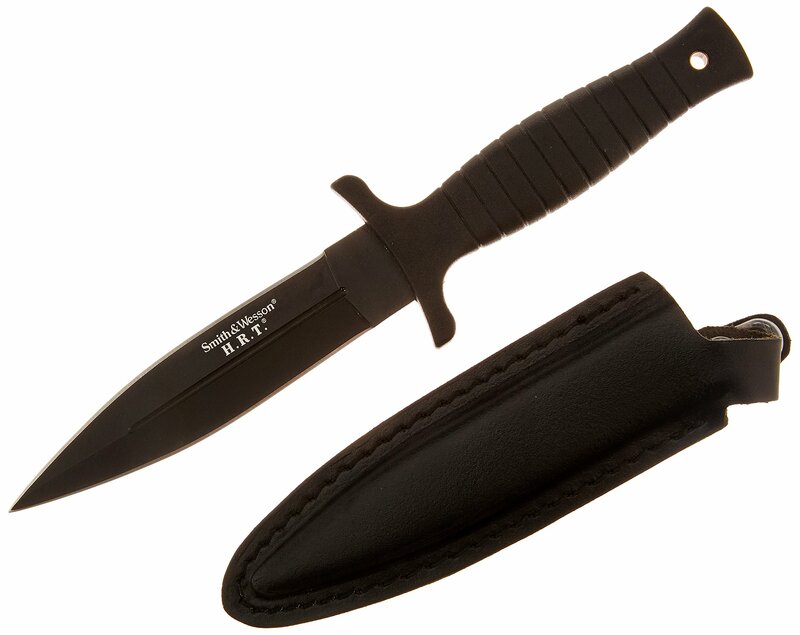 The benefit carrying the boot knife is it is small and can be concealed which means you are prepared to face dangers and risk. The boot knife is a reliable and great buy for self-defense but the best ones have certain features that makes it stand out. Make sure you check for the features before purchasing your personal self-defense tool. Design of the blade – The blade of the knife is available in various designs but the most common ones for boot knives is double edged with spear point or single edged with clip point. The former are used majorly for stabbing while later are better for slashing purpose. Depending on your requirement, buy accordingly. Steel Quality – It is one of the most important aspects because depending on the quality of the steel, it lasts its sharpness. The stainless steel blades made are tough and durable and mostly used in the blades. The high carbon steel imparts better sturdiness. Lengths of the Blade – In order to ensure maximum comfort make sure that the blade length is optimum and ideal to be used as boot knife. The length should be such that it should be able to conceal in your boot. Comfortable Handle – The handle of the boot knife should be comfortable enough and anti-slip because grip is very important while using the knife. It should not be very hard and uncomfortable. It is one of the best and widely used boot knives for its robust construction and sharp features. The blade for the knife is double edged spear made of stainless steel and extremely sharp to chop off things in seconds. The rubberized sandpaper like coating gives strong grip even in wet and slippery conditions. It is sturdy, concealable and perfect balance of feature and expense. The stylish and efficient tactical knife is a fixed blade one measuring 9 inch and is high performing for outdoor activities. It is the right size for a boot knife, made of half serrated blade in stainless steel. It is tough and durable with its overall size comfortable to carry along. The handle made of G10 material ensures superior grip even during wet and oily conditions. Superior grip available the with the G10 handle, suitable for wettest and oily conditions. The grip comes with lanyard hole at end. The fixed blade as suitably goes by the name secret agent is one of the most popular boot knives for its sturdy features and versatile use. It is light weighted weighing only 3.0 ounces and has blade length of 4.4 inch, easily concealable. The rubberized handle ensures smooth and strong grip for the user. The blade of the knife is made of superior quality 8Cr13MoV steel ensuring long lasting anti-corrosion properties. The knife should be convenient, comfortable and sturdy along with proper concealment. Boot knives are used by people as self-defense tool and are very handy in alarming conditions. It is not easy to find the best boot knife by merely going through the options but this comprehensive guide will help you make the right selection. The knives have been tested and tried by experts and recommended for use. If you are still confused, we suggest Smith & Wesson H.R.T SWHRT9B Full Tang Spear Point Fixed Blade Knife as the best option for the versatile usage and integration of great features. The knife is concealable, strong, sturdy and fixed blade made of superior stainless steel. With rubberized grip, it imparts anti-slip properties and is comfortable for use under any circumstance.